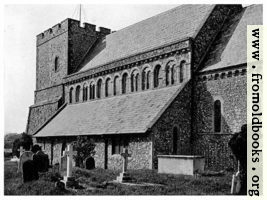 Images and short extracts from Mediæval Styles of the English Parish Church, by F[rank] E. Howard (?—1934). The book contains over 170 photographs. Since the author died more than 70 years ago, the text is out of copyright. Photographs taken in the UK by British citizens living in England before 1945 are generally also out of copyright; in addition, many of the photographers are explicitly listed (including the author) and died more than 70 years ago. All the pictures from this book that are on the Web here are out of copyright. The book was published posthumously with a preface by E.<A.<Greening Lamborn, who edited the manuscript for publication. Published by: B. T. Batsford Ltd.
1. Castor, Northamptonshire, from the South-West. A Norman Church with alterations and additions of each succeeding style. 114. Village Churches of the Decorated Period: Whissendine, Rutland. 46. The South Nave Arcade, Melbourne, Derbyshire, with stilted Norman arcade.